Danchek AD Strips – each package 30€ – Prices plus postage from Copenhagen and Handling Charges 20€. There are 250 pcs. 1x4cm strips in the black plastic bag. Inside the black bag you will find one bag with 1 gram silica. This has been prepared with a solution of 10% Sodium Carbonate and dried. This keeps the AD-Strip blue at all times. The card, which you can use for comparison of the acidity level is as accurate as possible. The AD-Strip is purely a chemical reaction in pH values and should be considered as such. Smell is of no importance in the evaluation and has been taken out of our documentation. Also there are fewer readings. The control card is in English – French – German and Spanish. Shipping charges at your choice Letter postage international Letter postage recommended GLS – DHL – FedEx – UPS and will be added. It is very sensitive indicator that senses the “Vinegar Syndrome” just by touching the film. The color is blue when in the pouch. After taking the wanted number of testers out of the pouch, squeeze the air out and close the pouch carefully. Take the lid off your film can, place the indicator on the film and make a note of the time. The reading can be done after 24 hours depending on the temperature. For cold conditions expect 2-3 days for an accurate reading. 24 hours is based on 20 degree C. Compare the reading with the color chart and make a note of the level of acidity. If the color changes to olive green (pH 4,6) you have reached the critical autocatalytic point, which is the point where you should consider separating it from the rest of the collection and begin to duplicate. If the indicator has not reacted within 24 hours nothing is critical. If you leave the indicator in the open air it will fade. Close contact with severely degraded acetate and nitrate films (touching and sniffing) may be a health hazard. 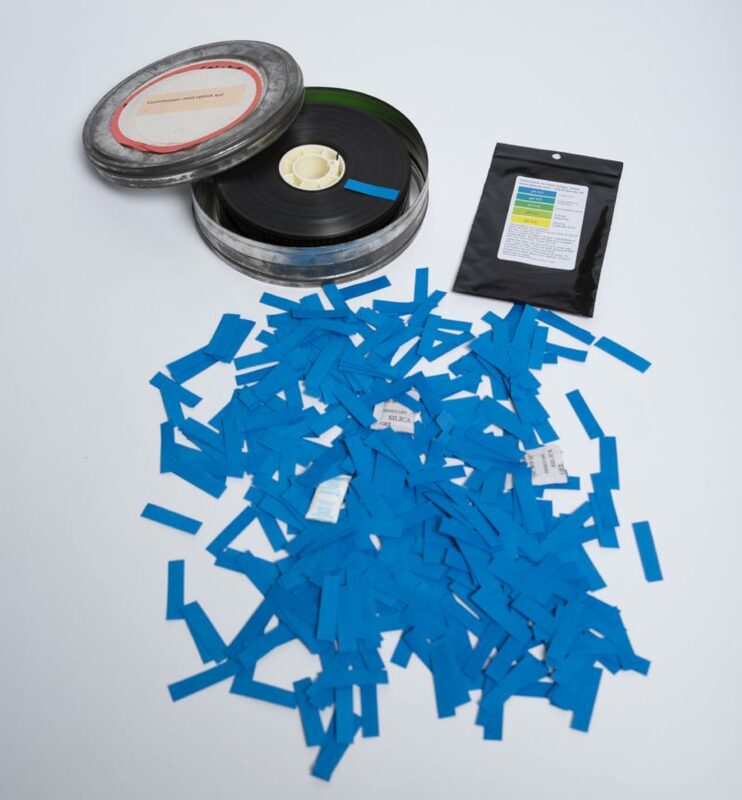 Acetic acid and other acidic products emitted by degraded film have been known to produce contact burns, skin and mucous membrane irritations, and other physiological effects. Protective gloves and adequate ventilation are strongly recommended for handling degraded films. There will be no further instructions.